Suddenly I am in the mood of writing. Bare with it for a while will u??hihi.. I think nowadays it's a must for a wedding to have flower girls kan? However, sometimes brides would prefer to have bride's maid yang ramai2 tu cz they are of course more reliable and cud also be used as good props too (when it comes to photoshoot nnt;p). One of the reason bride refused to have flower girls plak cz they are difficult to control (yela budak2) and no time to train. Nonetheless, most of the wedding I attended, they had both. For me, I had flower girls as well as bride's maid. They are my flower girls. My nieces. The most front is Qasrina (Baby) and at the back is Qistina (kakak). They are at the age of mmg susah nk ctl. I expected that. But they are the only nieces that I have and I would love them to function for my wedding. Hence, the flower girls. Btw, our w-planner has not just messing up with pelamin and my dress. They also forgot to provide me with flower girls' dresses. During our discussion, they promised to provide them but at the end..hummpphh..I don't how to describe them nymore.. So, one day before my wedding, we have to go seek for the dress. It's not that difficult cz we had previously aimed for this one kedai in PKNS. They sell a lot of flower girls dresses. I couln't remember the name of the kedai, but it is located dekat hujung2. Not in the middle.oke?? 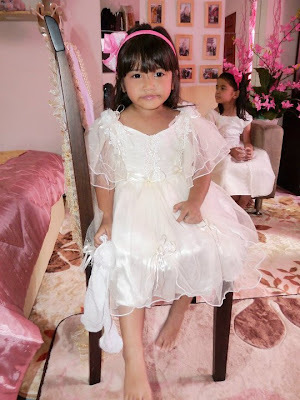 Hi, me too looking for flower girl dresses.. kat PKNS tu kat ground floor eh?? ok x price die?